Children can often experience aches and pains in the evenings or during the night commonly known as growing pains – that can be uncomfortable for them, but also make parents feel helpless to ease their child’s discomfort. The good news is there are a lot of different things that can be done to help with growing pains. 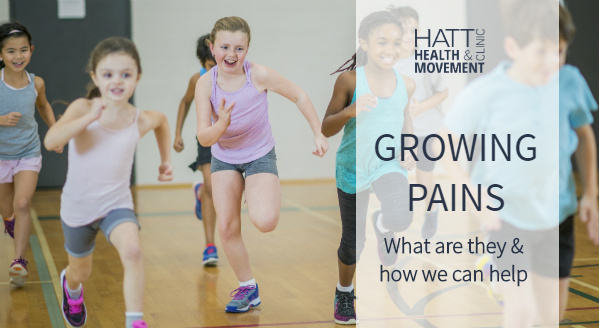 So we’ve asked one of our Physios to shed some light on this topic and clarify what growing pains really are and what you can do about them. There isn’t any conclusive research to show why growing pains occur, but there are a number of factors that can contribute to it – such as the rate of your child’s growth, the volume and intensity of physical activity, tight muscles, weight, foot posture, and many other factors. Growing pains tend to be more prevalent in active children and they can be common amongst siblings. Physiotherapy can help assess, diagnose and recommend the best treatment options to help alleviate growing pains. This may include regular Massage, the use of orthotics (custom-made insoles), a strengthening programme, anti-inflammatories, and much more. Children can often continue with their sports or activity during treatment, and our Physios will advise them on how best to do this. At the Clinic, all our Physiotherapists are experienced in treating children, so if your child or grandchild suffers from growing pains, don’t ignore them. Call our friendly team to book in for an assessment on 01380 730473 or click here to learn more about Physiotherapy at Hatt’s.